Due to the heavy rain this afternoon, practice at Sharpstown High on Thursday, May 19 has been cancelled. Due to the heavy rains and subsequent commuting difficulties, Tuesday’s practice at Sharpstown, Apr. 19, has been cancelled. Due to the heavy rain and subsequent flooding throughout the area, Tuesday evening’s practice at Sharpstown High School has been cancelled. 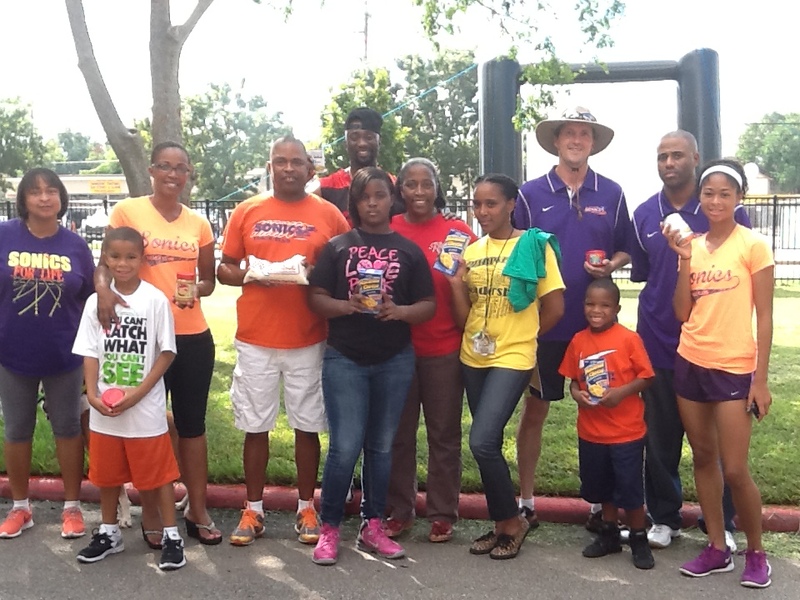 Thanks to all of the Sonics family members who turned out last Saturday at Sharpstown High to pitch in for the food drive hosted by FM 97.9 The Box. By all accounts, it was a big success! Good morning, Sonics family! Coach Goldy saw this promotion and thought it would be a great idea for the Sonics to get involved. As you know, Sharpstown High School has allowed us to practice on its track the past couple of years with little or no charge. We are not sure what will occur this coming school year, but we would like to show them our gratitude. Many students at Sharpstown, and within the Sharpstown community, struggle daily to provide food for their families. 97.9 The Box and IJustGotHit.com are joining forces to supply the food pantry with more goods. Let’s show our appreciation and suppor by showing up in full force with our Sonics shirts on and donate to the food pantry. The event begins this Saturday, September 6 at 10:00 AM. If we can get as many people as possible to meet up at 10 AM, make a donation and be on our merry way! Coach Goldy will gather everyone in the parking lot and we will then make a group donation. The Sonics organization will donate the first $100 worth of canned goods. If you can bring along some additional canned goods, it will all go towards a worthy cause. Below is a list of preferred food donations and the attachment provides additional information about the event. Please email me, Bertran.Bilton@aliefisd.net, if you are able to participate. Thanks in advance for your support! Thursday’s practice (3/27/2014) at Sharpstown High has been canceled due to inclement weather. Please contact your coaches if you need any instructions regarding this Saturday’s meet at Klein Collins. Saturday, February 8 will be the first day of conditioning workouts for the 2014 season. For our north side group, practice will be held at Klein High School from 10:30 AM – 12:30 PM. On the south side, we will be meeting at Sharpstown High School from 1:00 PM – 3:00 PM. The 2014 fee schedule has been posted on our Documents page and the formal registration documents will be available soon. Also on this page, you will find a handy flyer you can share with any young friends who may be interested in giving track and field a try. We’re anxious to see you all again and ready to create yet another exciting and successful season! Sonics south side practice at Sharpstown is canceled for Thursday, July 26 due to the Celebration of Athletes event taking place at Discovery Green in downtown Houston this evening. All Sonics athletes are encouraged to come to the event at 6:00 PM; we will be meeting in front of the Hilton Americas hotel. Please wear your Sonics t-shirt or other team apparel if possible. On Saturday, February 18, the Sonics will have their first practice sessions of the 2012 season. On the north side, they will meet at the Klein High School track at 10:30 AM and on the south side at Sharpstown High at 1:00 PM. This will be a basic conditioning session as we prepare for the competitions that begin in late March. The complete registration packet can be found here. UPDATE: Due to rain, the first scheduled practices have been postponed one week to Saturday, February 25.